I had delicious, juicy pineapple pieces for lunch. 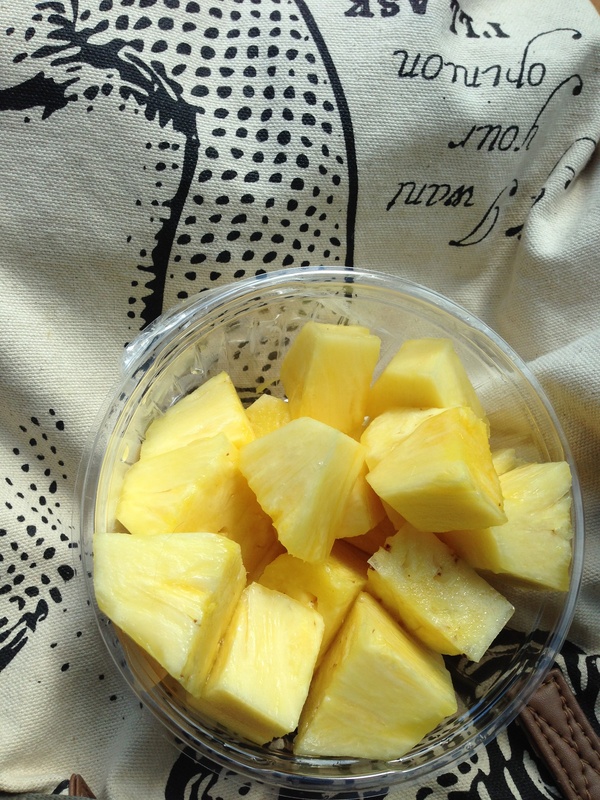 Pineapple is high in vitamin C which is great for the immune system. It’s also a good source of thiamine, B12, folate, copper, manganese and fiber. Pineapples contain enzymes called bromelain that reduce inflammation, bruising, pain and accelerate wound healing time. Bromelain is helpful for reducing inflammation from tendinitis, muscle injuries, sprains and strains. Bromelain was approved for treatment of sinus and nasal swelling after trauma or ear, nose and throat surgery by the German Commission E (the German equivalent of the FDA). Bromelain can kill some viruses and bacteria. Bromelain is helpful in reducing the pain of osteoarthritis. In 2000, the Annals of Internal Medicine reported bromelain supplementation helped to heal patients with ulcerative colitis. Research published in the journal Planta Medica found that bromelain was superior to the chemotherapy drug 5-fluorauracil in treating cancer in an animal study. The core of the pineapple has the most concentration of bromelain. Have you ever sprinkled some cinnamon on pineapple? Try it! Have you ever juiced pineapple with purple cabbage?